Located on the lower garden terrace level, the Roman Spa room offers the ultimate setting for an unforgettable romantic getaway. 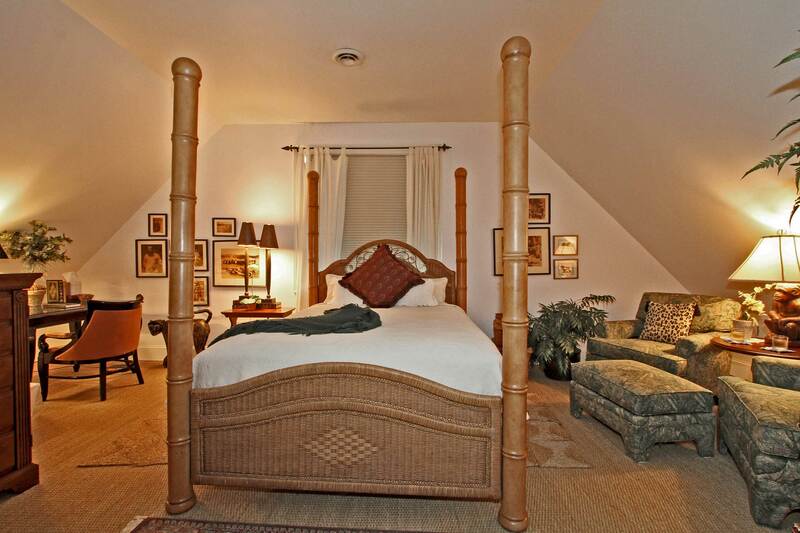 This charming room provides a cozy queen size bed dressed in luxury linen for enhanced relaxation. Enjoy a private bath with whirlpool tub for 2 and shower, spacious sitting area, big screen TV, wireless Internet access, massage table, and a fully stocked mini fridge for your convenience. Indulge in luxurious robes, linens and fresh towels in the comfort of the Roman Spa Room. Located on the lower Garden Terrace Level and loaded with everything you can imagine for an unforgettable romantic getaway retreat, the Roman Spa Room offers all the amenities. 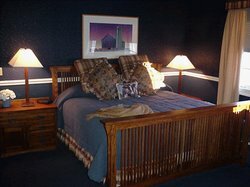 This unique room features a private bath with whirlpool tub for 2 and shower, queen size bed, sitting area, big screen TV, wireless Internet access, massage table, iron, hair-dryer, fully stocked mini fridge, telephone, high quality linens. Indulge yourself in the luxurious robes, linens and towels while lounging in this Unique Roman Spa Room. 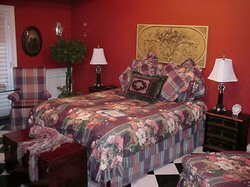 A favorite of honeymooners, the Red Room is a romantic garden level room featuring a private bath with whirlpool tub for 2 and shower, king size bed, sitting area, fireplace, wet bar and fully-stocked mini-fridge. Delight in the relaxation provided by premium bedding and luxurious fabrics. 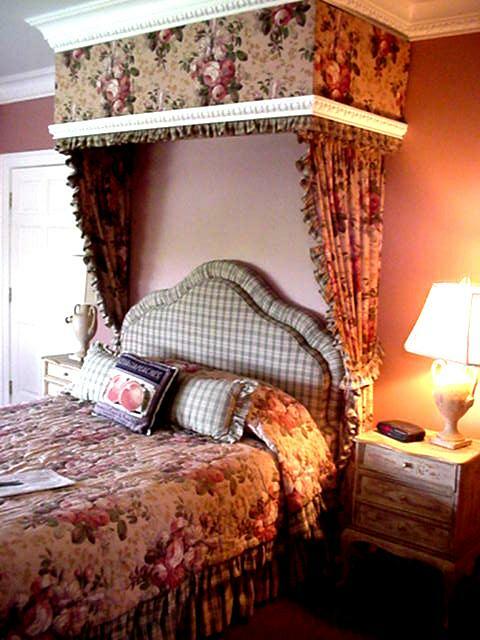 Share in the romance of this private room unlike any other room at the Claremont Inn & Winery. A favorite of honeymooners and those celebrating a special occasion. 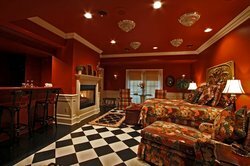 The Red Room is a romantic garden level room featuring a private bath with whirlpool tub for 2 and shower, king size bed, sitting area, fireplace, wet bar, TV, iron, hair-dryer, fully-stocked mini-fridge, wireless Internet access, and high quality linens with luxurious fabrics and bedding. 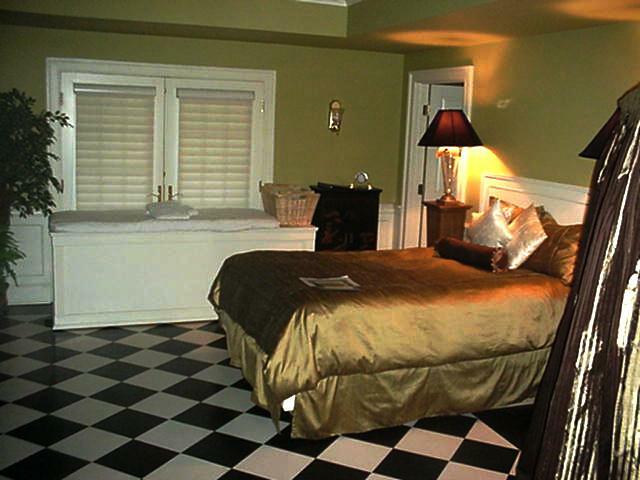 This romantic room is unlike any other room at the Claremont Inn & Winery. The Secret Garden Room is among our most romantic and favored rooms, perfect for a honeymoon, anniversary or birthday getaway! 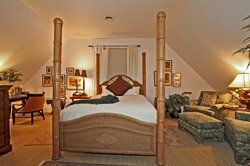 This bright and cheery room features a private bath with 2 person whirlpool tub and shower, large screen TV, wireless internet access and cozy king size bed dressed in luxury linen. 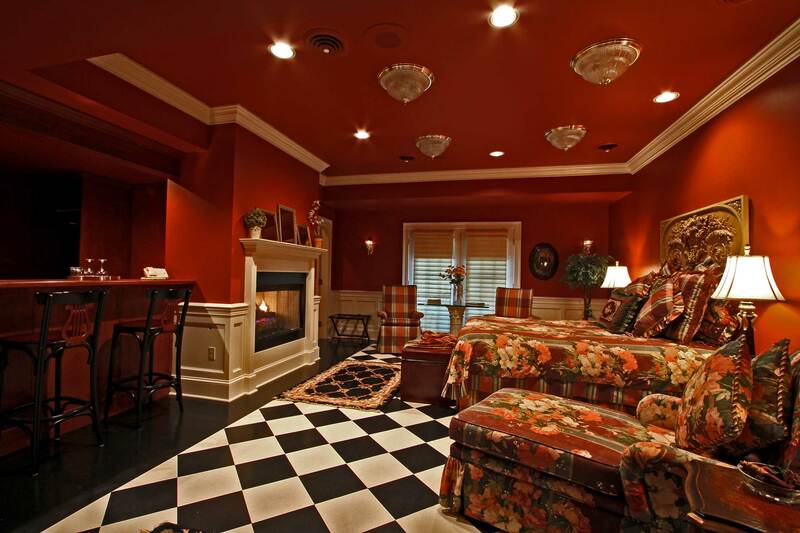 Relax by the fireplace in the spacious sitting area, perfect for lounging. *This room offers additional sleeping space for 2 guests available on queen size Murphy Bed. 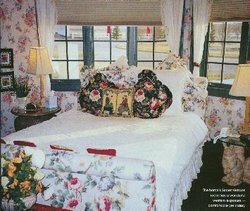 The Secret Garden Room is among our most romantic and popular rooms, perfect for a honeymoon, anniversary or birthday getaway! 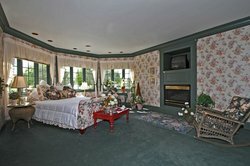 This bright and cheery room features a private bath with 2 person whirlpool tub and shower, king size bed, sitting area, fireplace, TV, wireless Internet access, and high quality linens. Additional sleeping for 2 guests available on queen size Murphy bed in this large room. Enjoy the cool & relaxing mountain lodge feel of the spacious Colorado Room. Perfect for the weary travelers and families, the Colorado room features a private bath with whirlpool tub for 2 and shower, king size bed outfitted in premium linens, sitting area, TV, wireless Internet access, iron, hair-dryer, and a fully stocked mini fridge. 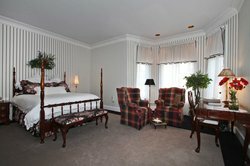 This room offers additional sleeping space for 2 on queen sofa bed in this spacious, uniquely designed guest room. The Sunset Room offers sweeping westerly views of the Colorado plains. This bright, deluxe room features a private bath, shower, queen size bed, sitting area with recliners, desk, TV, wireless internet access and a fully stocked mini-fridge. Indulge in a whirlpool tub designed for two. 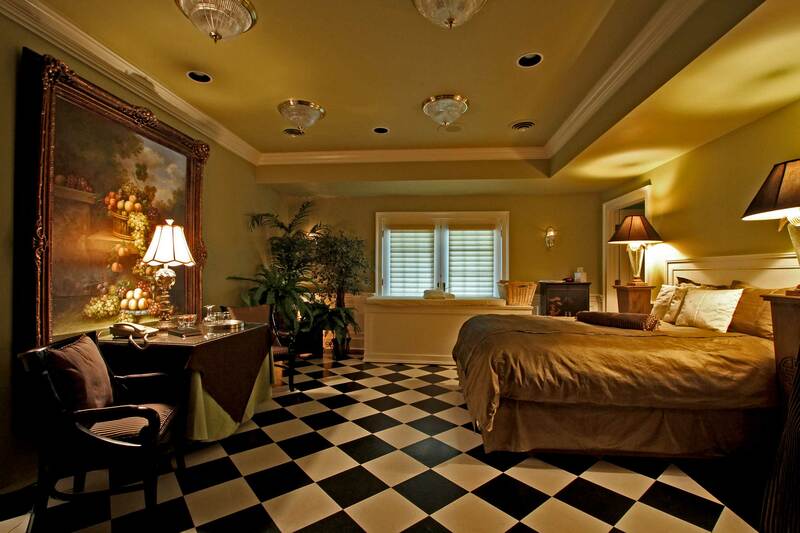 Enjoy the spectacular view and take comfort in this room designed for ultimate relaxation. Enjoy the colors of the sunset from the The Sunset Room! The Sunset Room offers sweeping views of the panoramic Colorado sky. 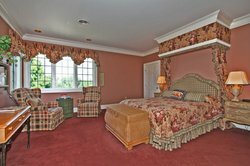 This deluxe room features a private bath, queen size bed, sitting area with recliners, desk, TV, whirlpool tub for 2, shower, wireless Internet access, telephone, iron, hair-dryer, fully stocked mini fridge and high quality linens. Just beautiful. Bathed deep blue, the Golden Prairie Room is handsomely located on the top floor of the Inn. 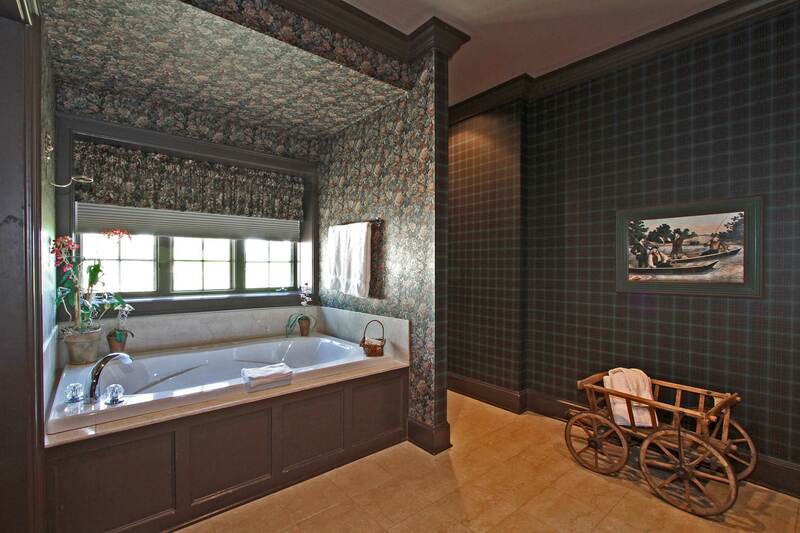 Enjoy the luxury of a private bath with a soaking tub for 2 and shower. 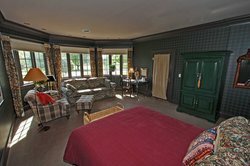 This room features a king size bed dressed in quality linens, sitting area, desk, TV, wireless internet access and fully stocked mini fridge. 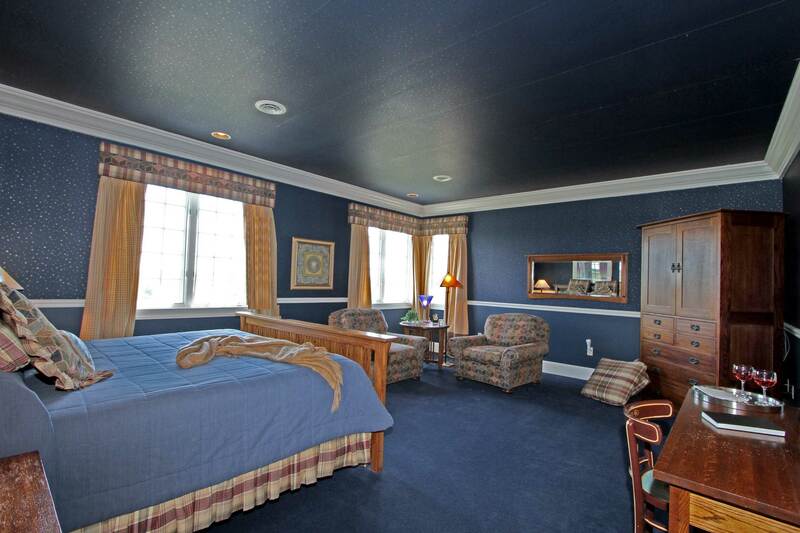 Decorated in deep blue, the Golden Prairie Room is a handsome top floor room. 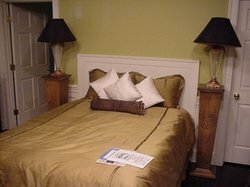 This guest room features a private bath with whirlpool tub for 2, shower, king size bed, sitting area, desk, TV, wireless internet access, telephone, iron, hairdryer, fully stocked mini fridge, high quality linens. 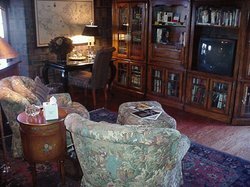 The Library Room is a large, main level room, offering easy access and an inviting atmosphere for you to enjoy. This room features a private bath, queen size bed dressed in premium linen, sitting area, desk, TV, wireless internet access, and fully-stocked mini-fridge. Step into the refreshing luxury of a large marble shower. 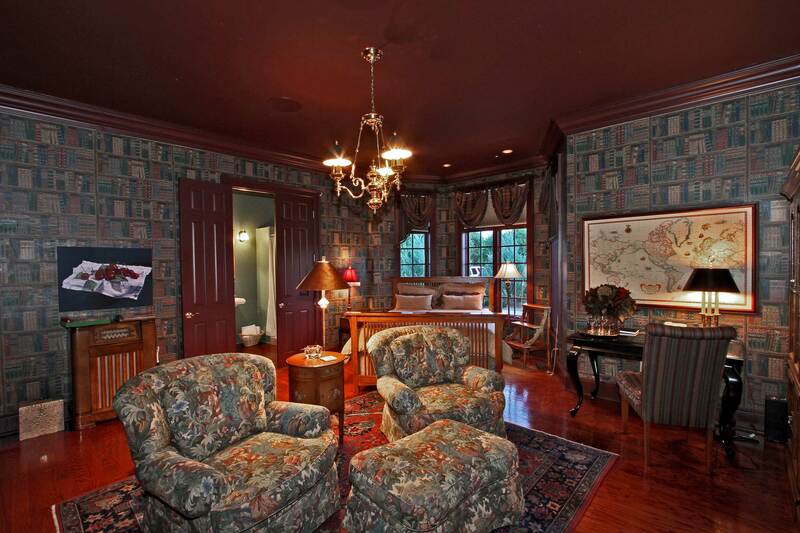 Detailed with stained, hardwood floors, this room also features a collection of reading material on the bookshelves. A book, a glass of wine and off you go! The Library Room is a large, main level, easy access, inviting room that features a private bath, queen size bed, sitting area, desk, TV, wireless Internet access, large marble shower, telephone, iron, hair-dryer, fully stocked mini fridge high quality linens, hardwood floors and a plethora of reading material on the bookshelves. 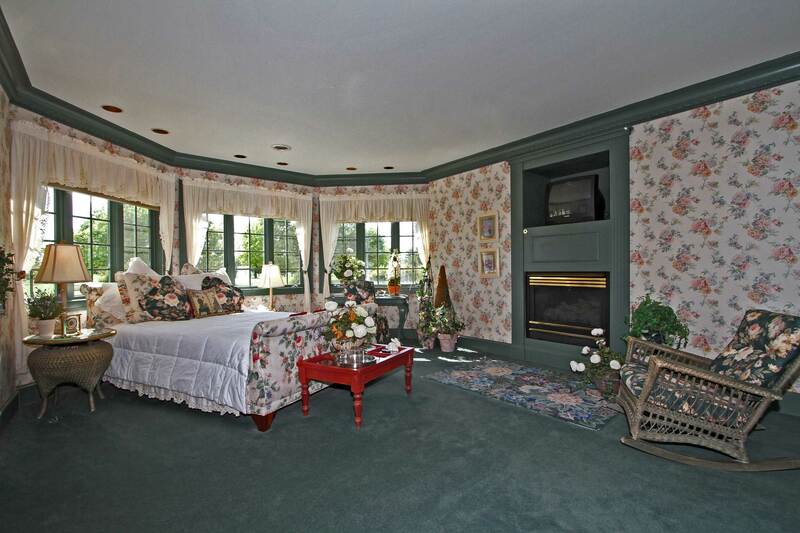 The Waverly Room is tastefully adorned in country cottage decor. 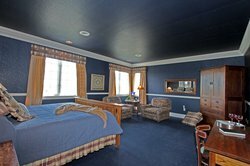 This top floor guest room features a private bath with whirlpool tub and shower, queen size bed, sitting area, desk, TV, wireless internet access, fully stocked mini fridge, and high quality linens. It is no wonder that this is an award winning room! 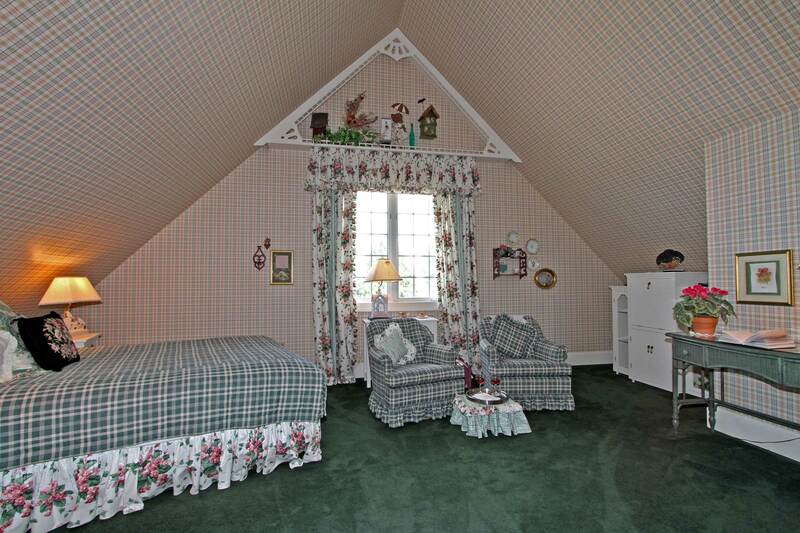 The Waverly Room is tastefully decorated in country cottage decor. This top floor guest room features a private bath with whirlpool tub and shower, queen size bed, sitting area, desk, TV, wireless Internet access, iron, hair-dryer, fully stocked mini fridge, telephone and high quality linens. It is no wonder that this is an award winning room! 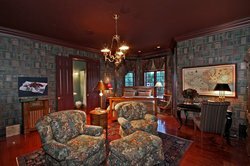 You'll know you are no longer in Kansas as you settle into the calm and relaxing setting of this British Colonial styled room. 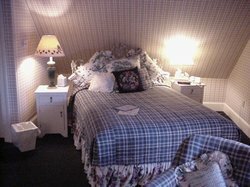 The Out of Kansas Room features a private bath with shower and a "netted" whirlpool tub (you just have to see it), queen size bed outfitted in superior linen, sitting area, desk, TV, wireless Internet access and fully stocked mini fridge for your enjoyment. You'll know you are no longer in Kansas as you settle into the calm and relaxing setting of this British Colonial styled room called the Out of Kansas Room. This room features a private bath with shower and a "netted" whirlpool tub (you just have to see it), queen size bed, sitting area, desk, TV, wireless Internet access, telephone, iron, hair-dryer, fully stocked mini fridge and high quality linens. The Claremont Room is classically styled with a four-poster bed and traditional cherry furnishing, creating a truly elegant atmosphere. Located on the main level, this wheelchair accessible room offers a queen size bed dressed in premium linen, private bath, sitting area, TV, wireless Internet, shower and fully stocked mini fridge. Classic style - casual comfort! 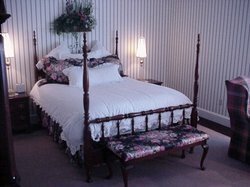 The Claremont Room offers classic styling with a four-poster bed and traditional cherry furnishings make this room truly elegant. 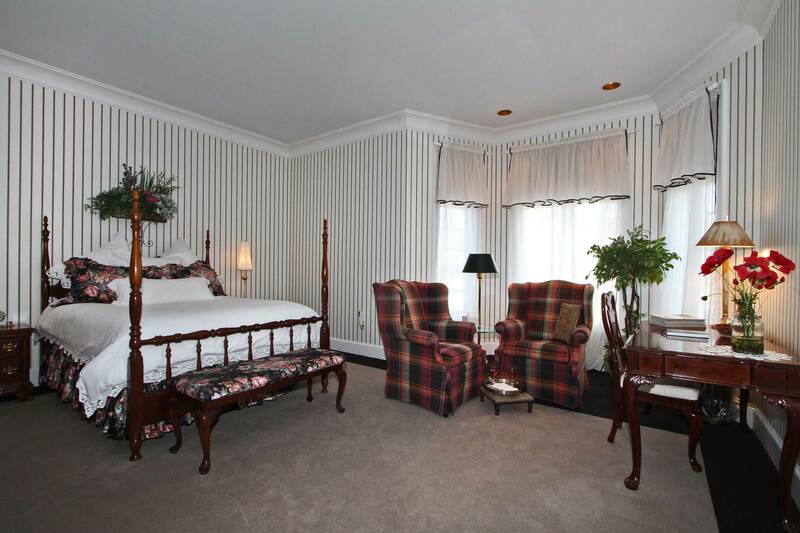 This main level room features a queen size bed, private bath, sitting area, TV, wireless Internet, shower, telephone, iron, hair-dryer, fully stocked mini fridge, high quality linens. This room is wheelchair accessible.